WARNING -- still in development and not yet ready for live use, though any testing is appreciated. VATStuff provides a double-entry bookkeeping system, with facilities to create purchase orders, invoices and to record costs and calculate VAT returns. VAT calculations are designed to meet UK regulations, and are not applicable to other states. 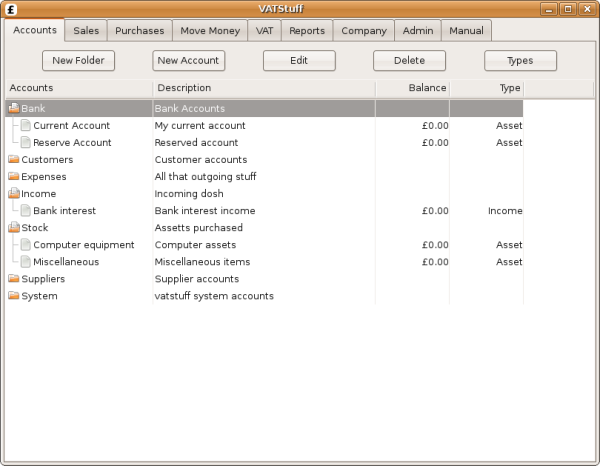 Even for non-VAT registered companies, VATStuff enables you to record your transactions and produce invoices. VATStuff requires python version 2.5 or later and depends on a number of libraries, which you need to install. These are; WxPython, PIL and Reportlab. This will create a directory ‘vatstuff' with everything beneath it. Should you want to uninstall, delete this directory and its contents.